Digital Concepts CH-3988S Charger and 4 each AA + AAA NiMH Cells: Craptastic! Got a Digital Concepts CH-3988S charger with quartets of AA & AAA cells from buy.com (which no longer sells it, no surprise, but it’s still available elsewhere) on closeout for about 12 bucks delivered, down from the “regular” price of something like $40; anybody who paid that much got well and truly hosed. I fully expected the cells to be crap and they were: they don’t even bear a manufacturer’s name. Tellingly, they weigh 25 grams each, lighter than the 28-30 grams of more cough reputable brands. 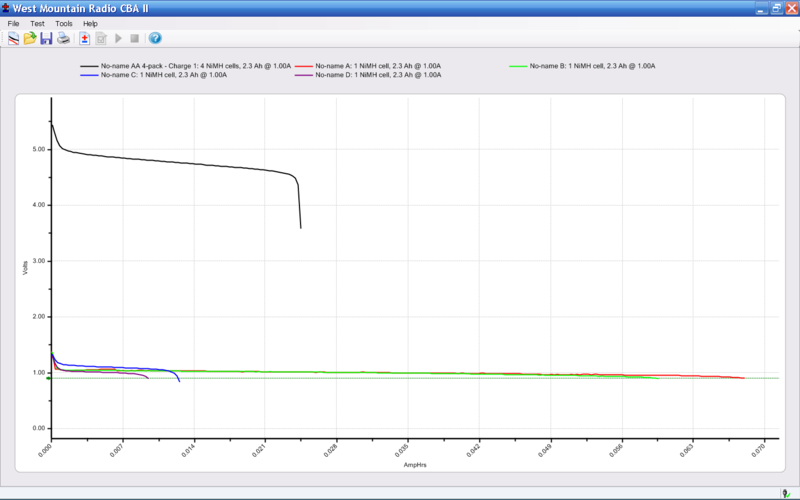 The upper trace (click the graphs for readable pix) is the four AA NiMH after the charger said it was happy with them. The trace drops off the cliff at about 25 mAh. Call it 1% of nominal capacity. The four lower traces are the individual cells after another trip through the charger. 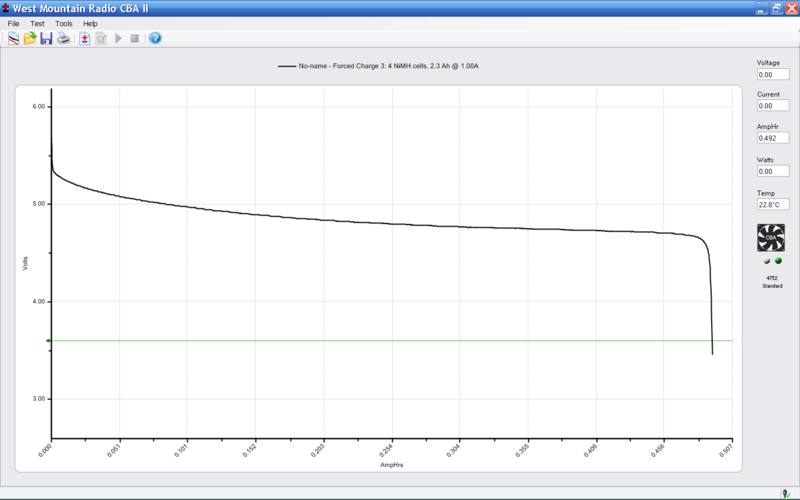 The far-right end of those bottom curves is 70 mAh, with the cell voltage barely over 1 V for the entire discharge. Fairly obviously, they’re not accepting a charge. Charging the cells in a known-good 400 mA charger (roughly C/6) brought the best cell up to 160 mAh, with the rest around 100 mAh; the charger was happy with them after far less than 6 hours, so apparently the cells display a much higher terminal voltage than they should. So I plunked them in a dumb 250 mA slow charger and let ’em cook for the full 8 hours. That should, in principle, give them roughly 2 Ah of charge, no matter what the terminal voltage may be; I measured 1.8 V, which is far too high for that rate. Crap. Pure, utter, unadulterated crap. The cells supplied 500 mAh, much more than before, but that’s so far below their rating it’s not even funny. There’s obviously one cell in there that’s bad, but the others can’t possibly be far behind. I didn’t waste any time on the quartet of AAA cells, but I expect they’re pretty much the same. It’s faintly possible that exercising these turkeys will bring them up to maybe 50% of capacity, but it’s not like that’d make me ecstatic. The reviews you’ll find here and there support the conclusion that something is wrong with these cells. Here’s the result of the next cycle, after a night in their very own charger. 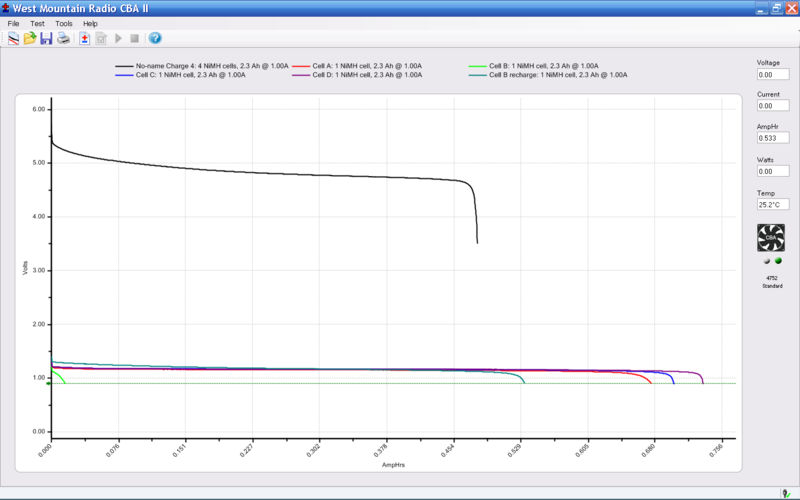 The upper trace is all four of them together, once again failing after 500 mAh. The four lower traces labeled “Cell x” are the individual cells, tested without recharging. Three of the four have about 700 mAh left in them, which would bring their total capacity to 1200 mAh, roughly half of their nominal capacity. Cell B, the green trace, is obviously the weak link, as it failed almost instantly. Recharging it on a known-good charger got it back up to 530 mAh (the “Cell B recharge” curve), roughly 25% of its nominal capacity. So much for the idea it’ll get better if you treat it right. Remember that the nominal AA cell capacity is 2.3 Ah, so charging the four AA cells included with it requires three or four hours. Well, OK, only 2.5 hours if you do ’em pairwise, but that’s five hours total. On the other paw, the charger does (seem to) monitor the cell voltage and cut off automagically, on either negative delta-V or maybe just peak voltage. Unleashing it on a pair of partially discharged Tenergy RTU 2.3 Ah cells indicates that it cooks the piss right out of them, there toward the end. The charger is (probably) OK for low-rate charging of known-good cells, which is what I got it for; the cells accompanying it are crap. It’s not worth returning for twelve bucks, seeing as how the shipping would eat half of that. So, anyway, if you ever wondered what a bottom-dollar charger-with-cells offer gets you, now you know.